Brunch in the Gardens – Sneak Peek! 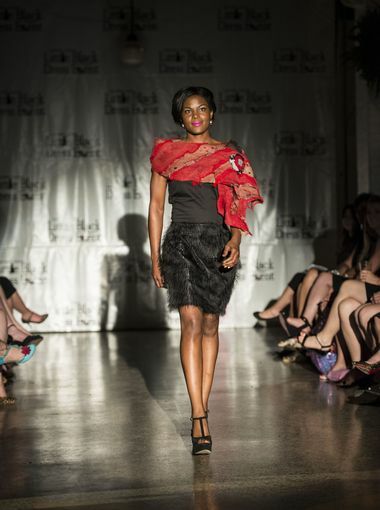 For the past few years, we’ve done the “Little Black Dress” event with Summerfair and it was a FAB way to showcase jewelry, handbags, and scarves by Summerfair artisans on the models wearing LBDs. But it was on a Friday night after most of the Summerfair vendors had closed up for the night, and since attendees were all dressed up in heels so they weren’t able to walk around and shop at the ones still open. So, this year, we’re switching things up and having a brunch on the Saturday morning of the fair. This way, you can start your day, enjoy a mimosa, bloody mary and brunch bites — while viewing the themed vignettes with models wearing Summerfair artisan designed fashions (and modeling next to sculptures and other art by Summerfair artists!) — and then you can spend the rest of the day shopping the fair! Tickets are only $20, and it includes brunch bites, swag bag and entrance into the fair! More details below — click here to RSVP! Hope to see you there! Summerfair Cincinnati and Cincy Chic join forces for the inaugural “Brunch in the Gardens” – A fun and fab way to begin your day of Summerfair shopping! Enjoy complimentary brunch bites, coffee provided by Coffee Emporium, swag bag, photo booth and a freeze model fashion show featuring Summerfair artisans. And don’t forget the gourmet Mimosa and Bloody Mary Bar! Tickets are $20/person and include entry into Summerfair. Online ticket sales end midnight May 29. tickets will be available for purchase (CASH ONLY) at the door for $25. All proceeds benefit Summerfair Cincinnati’s award, scholarship and exhibition programs for local artists and arts organizations. Recap: Summerfair LBD Fashion Show! WOW WOW WOW! Those are the only words (well, technically, it’s just one word) that I can think of to describe Friday’s LBD fashion show! Not only did we have a record crowd of 350 attendees and record sponsorship support (more than 20 awesome sponsors! )… but we also put together our best LBD fashion show yet! See, the idea for this event came up four years ago when Summerfair reached out to me about how they can reach a fresh, new demographic. I got to thinking that I love all the jewelry artisans who come from all over the U.S. to exhibit at this show… and what better way to showcase a great accessory than on a classic LBD. So, I suggested that we do a fashion show where we work with local designers and boutiques to have a fashion show full of fun LBDs, and then accessorize them with Summerfair artisan creations, like jewelry, handbags, scarves and hats. They loved the idea, and we’ve been doing this fashion show every year for the past four years. It’s so exciting to see it continue to grow! Not only do 100% of ticket and raffle sales go to Summerfair’s annual programming, but the fashion show gives the attendees a sneak peek of Summerfair exhibitors that they can shop with all weekend long! Click here to check out a great slideshow of pics from the event and fashion show! The Summerfair Little Black Dress tickets are officially ON SALE!!! We just posted the link a few minutes ago! And let me just tell you ladies, these tickets are going to go FAST! The first 100 to RSVP will not only get a swag bag, but also one of only 100 exclusive seats along the fashion show runway. 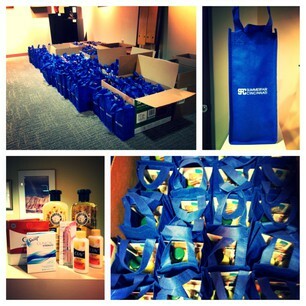 The next 100 to RSVP will get a swag bag (which is a reusable tote bag filled with goodies). So, get in while the gettin’s good! All the info about the event is below! See you there! 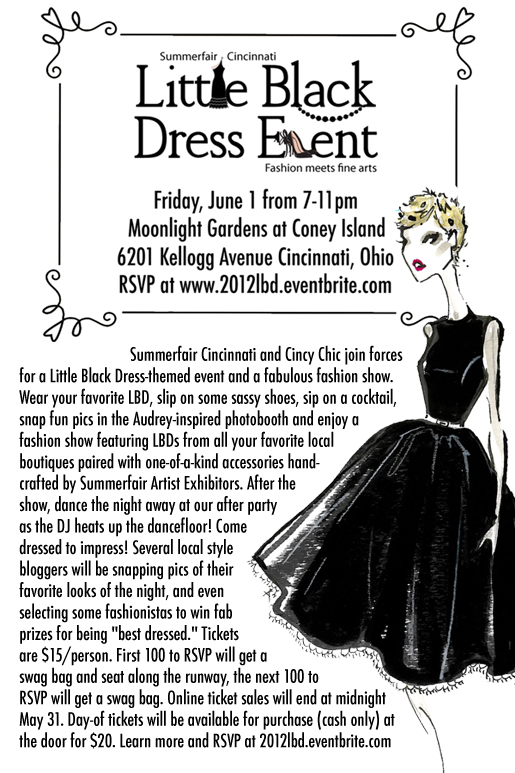 Summerfair Cincinnati and Cincy Chic join forces for a Little Black Dress-themed event and a fabulous fashion show. Wear your favorite LBD, slip on some sassy shoes, sip on a cocktail, snap fun pics in the Audrey-inspired photobooth and enjoy a fashion show featuring LBDs from all your favorite local boutiques paired with one-of-a-kind accessories handcrafted by Summerfair Artist Exhibitors. After the show, dance the night away at our after party as the DJ heats up the dancefloor! Tickets are $15/person. 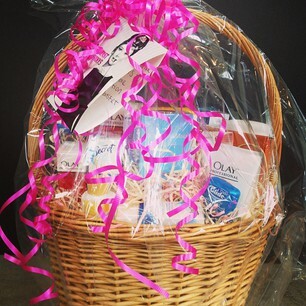 First 100 to RSVP will get a swag bag and seat along the runway, the next 100 to RSVP will get a swag bag. Online ticket sales will end at midnight May 31. Day-of tickets will be available for purchase at the door for $20 (cash only). Click here to RSVP. Get Ready for the June 3 LBD Event! 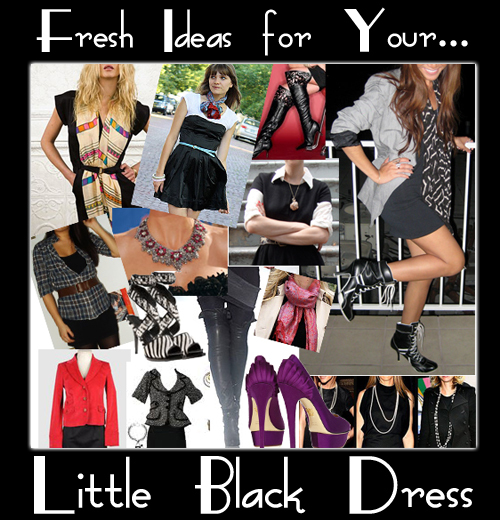 I’m SOOOOO excited for the first-ever Little Black Dress event coming up on June 3. This fab fashion show and event centered around the classic wardrobe staple is the official kick-off of the entire Summerfair weekend! Cincy Chic is helping to style the fashion show, which I’m really excited about. I’m getting the LBDs from Black and White Exchange and Three French Hens, and then accessorizing with hand-crafted items from Summerfair artisans. 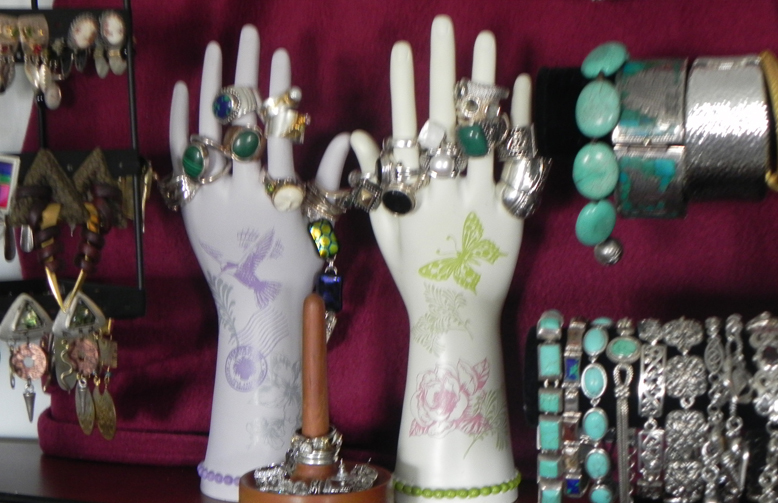 So, in planning all of this, I was talking with Sharon Strubbe, Summerfair’s Executive Director, and found out she has a crazzzzy extensive collection of Summerfair jewelry she’s been amassing throughout her years of involvement with the fair. 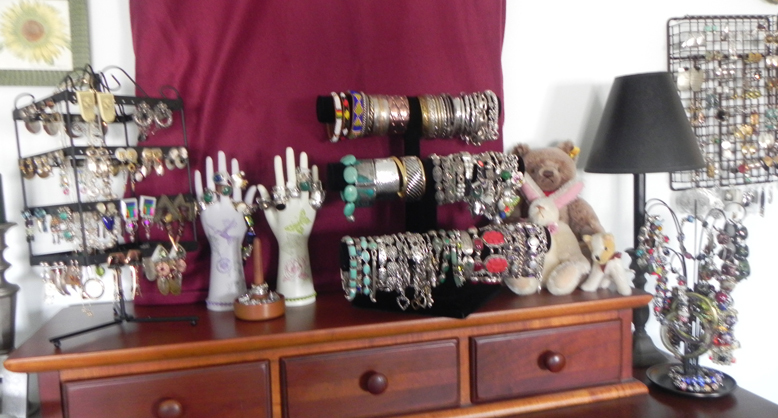 I asked her if I could snap some pics of all her Summerfair jewelry, and she proudly agreed. You wouldn’t believe all the beautiful jewelry she has! And it’s unbelievable to think that it’s all hand-made from artists who come from all across the U.S. for this fair. Just seeing all this jewelry got me so excited for the show and the first-ever LBD event to kick off Summerfair weekend! Click here to buy your tickets (only $15), pick out which shoes and accessories you’ll spice up your LBD with – click here if you need some advice – and I’ll see you on June 3!